When driving toward Whistler from Squamish, visitors will always pass by a small lake on the left side of the Sea to Sky Highway. Brohm Lake and its fishing are often unnoticed. While its fish are small, if solitude is what you are looking for, this is a weekend destination or a quick fishing pit-stop worth considering. Brohm Lake is in Brohm Lake Recreational Site, just several kilometers north of Squamish. To get there, simply continue driving north on Sea to Sky Highway (Highway 99) after arriving in Squamish. Look for the entrance to Brohm Lake Recreational Site on your left. The parking lot is beside the highway. The lake shoreline can either be accessed by trails at the recreational site or along the highway. There isn't a proper boat launch, so crafts bigger than 10ft can be hard to bring in through the trail. Brohm Lake is typically stocked with rainbow trout by the Fraser Valley Trout Hatchery during April and May, so fishing is obviously best during these months. Summer fishing can be good if temperature remains low, but generally it is not that productive compared to other Region Two lakes. It is also populated with cutthroat trout that measure between 4 and 8 inches long. Due to the low food productivity, these cutthroat trout do not grow much bigger than this size range. Fall fishing can be good once again after recreational usage lightens, but there are usually better fishing destinations during that time of the year. Brohm Lake is quite small and narrow, so a float tube or small boat is best if you decide to use a floating craft. Shore fishing is available on the east side of the lake. The depth change is quite steep so anglers do not have to cast far to find some fish. The southeastern part of the lake is made of rocky ledges where you can sit and fish, but the noisy highway behind you can often ruin the experience. A short walk from the parking lot will take you through the woods, which divide the lake and the highway so noise is reduced significantly. When fishing from shore, the use of a float can keep your line away from debris in the shallows. On a boat, a bottom rig used to drop straight down is best. Bait such as deli shrimp, dew worm, single eggs, maggots will produce. Your hook size should be between size 4 and 8. Casting and retrieving small artificial lures from shore can also be effective. This allows you to cover more area and sometimes hook up larger, more aggressive fish. A small spoon that flutters and sinks slowly to the bottom before it is twitched and retrieved is irresistable to trout. Flyfishing is difficult from shore at Brohm Lake due to the lack of backcasting space, therefore a float tube is needed. Microleeches, dressed in black, olive or brown with some flashes, are the typical patterns used by local anglers. The fly can either be retrieved slowly, or suspended under a strike indicator. Small cutthroat trout at Brohm Lake often attack the fly in large schools, so it maybe advantageous to use larger hooks if you are targeting rainbow trout. 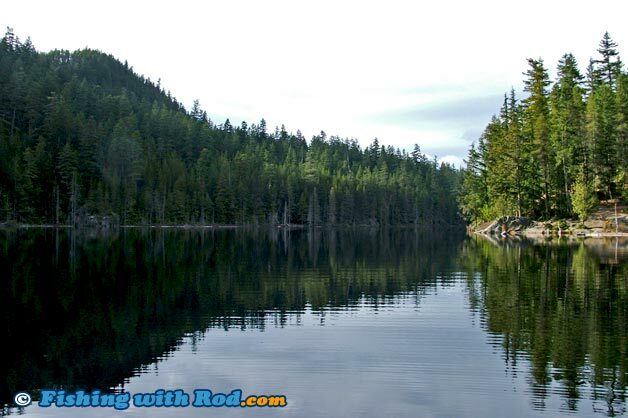 Brohm Lake is located in Region 2 in the British Columbia freshwater fishing regulations. Please respect other users when using the area. Keeping the noise level down and picking up your own garbage makes everyone's experience enjoyable.